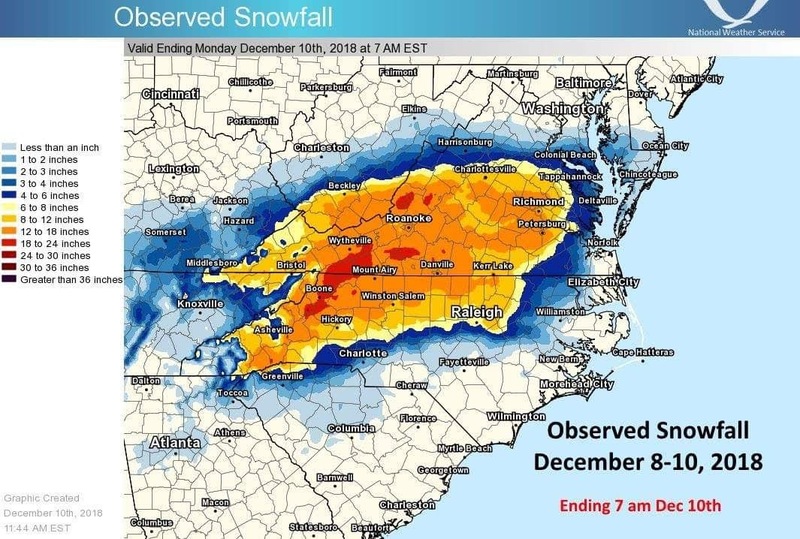 VirginiaWx: Top Weather Stories of 2018.. and a sneak peek into 2019. Top Weather Stories of 2018.. and a sneak peek into 2019. 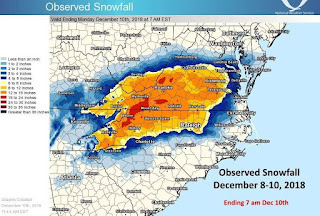 I do make snow maps for the entire region, but I am Lynchburg centric on much of my banter talk because I live there. It could easily be made this has been the most extreme weather year EVER in the Hill City. I'd refer to you Kevin Myatt from the Roanoke Times for the year in review for the Roanoke/NRV region. My top events in order. Wow, A tornado started on Timberlake/Waterlick and ended way up in Amherst County. This was the first actualy tornado in the city limits in recorded history. Hands down, the most impressive event of the year. Click here for the NWS write up on the storm and click here my favorite video from the Compter Exchange is the Tornado heads up Timberlake. I recall seeing the first radar image and thinking it may get ugly and it was worse than I ever could have imagined. A large swath of our region saw 5-8 inches of rain in 2 hours causing incredible flooding. Here are two images that show radar totals , and keep in mind radar totals are often underdone. The red areas exceeded 6 inches of rain. It was a sharp cut off with the reporting location at the airport seeing under one inch of rain in that time period. 3. Has to be the December snowfall. You could argue this was the biggist region wide storm since January of 1996. Other storms had more in certain areas, but very few areas of the region had less than 10 inches. (Dec 09 and Feb 14 would be the competition. 4. Record setting precipitation: For the year we are over 60 inches and should see another inch or two from rain Thursday into Friday. I will add the rainfall for Michael and Florence in this for Lynchburg specific, even thought the impact of those events, especially Michael were greater in Roanoke/ Danville. For everyone in our area, this is the wettest year on Record. With the big start to winter, all we need is to hit the climo numbers for each month and we finish in my stated ranges. With that, those numbers are averages and we never fit weather into nice neat boxes. I'm fairly confident we are heading back towards a colder patter but it will take a while to really ramp up. By Jan 5th the pattern doesn't stink for anything but rain. By Jan 10th, we could see more than a nuisance event. By Jan 20th, we may end up in a pattern that has a few threats in sight.. meaning a storm ends Monday and we are already talking about another even Saturday. Remember that in the low- moderate, west based El Nino winters, 86-87 and 65-66 had pretty big 1-2 week periods and 02-03 had literally a storm every Thursday from Jan 15th on until the Presidents Day sleet fest. Not that cold is fun without snow, but this may be a "kids stay home from school because it's too cold" day or two during the colder stretch. If lows are in the single digits and highs are not expected past the high teens, the usually pull the plug on school. Of course, nothing is a lock yet and we will fine tune this as we move in closer. Record storm wrap up and what's next?? Next weekend's possible Snow/Ice event..